A new ad by David Shapiro accuses the Republican congressman of voting to enrich himself. 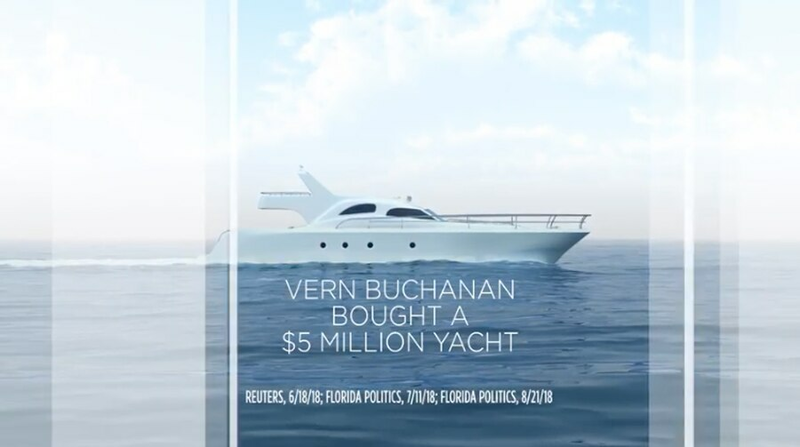 Democrat David Shapiro released a new television advertisement Friday that hit Republican Vern Buchanan over, you guessed it, Buchanan's yacht. The 30-second ad, which will air starting Friday in the Tampa market, accuses the incumbent Republican of voting in 2017 "to give wealthy insiders like Vern Buchanan a tax handout of up to two million dollars." Images of Congressional Republican leaders Paul Ryan and Mitch McConnell float across the screen in the spot, a motif reminiscent of Buchanan's attempts to tie Shapiro to Democratic House Minority Leader Nancy Pelosi. The yacht has already become a central theme in the contest between Buchanan and Shapiro for control of Congressional District 16, which covers parts of Sarasota, Manatee and Hillsborough counties. Buchanan purchased the vessel, Enterprise, on the same day he voted for the 2017 Tax Cuts and Jobs Act. Democrats say that bill disproportionately benefitted wealthy Americans like Buchanan, who made a fortune buying and selling car dealerships before he was elected to Congress. Shapiro also criticized Buchanan last month following a report that showed the congressman got a loan for the yacht from a company that lobbied for the 2017 Tax Cuts and Jobs Act. And in July, a dark money group took out an ad in the Tampa Bay Times offering $500 to the first person to send the group a picture of the luxury boat. Check out Shaprio's ad, "Rig," here.